To install EasyDose, a product key supplied upon completing the purchase of EasyDose will be received via email detailing how to download and install EasyDose. These instructions form part of that process. EasyDose has some prerequisites. The install process will perform these with some automation. Note: EasyDose should be installed by technically capable IT personnel. Print these Installing EasyDose Instructions. 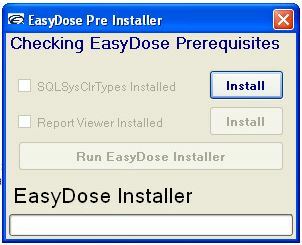 Review the System Requirements before attempting to install EasyDose. The email received after the purchase of EasyDose will contain a link to the installation page on the EasyDose website. This email will contain your Licence Key. Running the link will take you to stage 1 of the installation process. 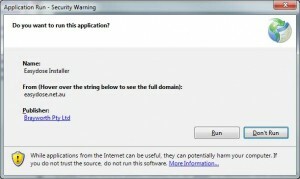 As with all internet sourced software, there is a security warning and you will need to resolve this. Please note, this software is electronically signed by our developer Brayworth Pty Ltd which is authentic. Selecting to run this application will start the install process. If you are installing EasyDose on a Windows XP computer, you may need to install the following features. Note, this will increase the installation time by several minutes. The Pre-Requisite Checker will ensure the above required Microsoft.NET framework and Installer are installed and two related runtime packages are installed. If they are already installed, the Run EasyDose Installer button will enable and a second web page will be presented. The security warning will reappear, as this is a second internet sourced program. Congratulations – you have installed EasyDose !